When you enter the gates of Ashford Castle in Ireland, you know you are visiting a very special resort. The 350-acre estate offers everything from golf to trout fishing to lake cruises to falconry. The Castle has one of the best equestrian centers in Ireland and houses a luxury hotel and spa. Ashford Castle Hotel is located northeast of Galway, near Cong, in the Western region of Ireland. The castle overlooks the shores of the Lough Corrib, the second largest lake in Ireland, located northwest of Galway. The village and countryside of Cong, where the 1950's classic John Wayne movie "The Quiet Man" was filmed, is just down the road from the castle. 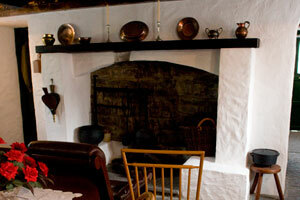 You can watch a showing of the film at the castle, or tour the Quiet Man replica cottage in town. You may want to take a walk on the trails throughout the castle grounds and then relax with a gourmet meal at the world-class George V Room. After you have an after-dinner beverage in the Prince of Wales Cocktail Bar, you will retire to your elegant accommodations. Each room is individually designed with period furnishings and has a view either across the beautiful gardens or over the waters of Lough Corrib. You really won't want to leave this majestic castle resort. Ashford Castle in Ireland was built in 1228 by Anglo Norman de Burgos. 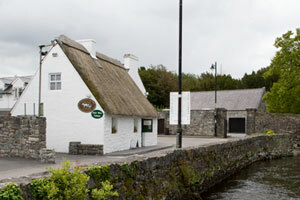 Owners, including the Guinness family, have changed over the years. The castle has evolved from defense to French chateau to Victorian neogothic. The castle has been beautifully decorated and cared for over the centuries.Guests at the Castle have included American President Ronald Reagan and the Prince of Wales George V.
You may fly in to Shannon Airport, Galway Airport, Ireland West Airport, Belfast Airport, or Dublin Airport to visit this beautiful castle. 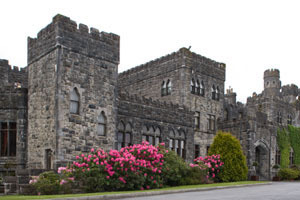 Check for rates and availability on the Ashford Castle website (opens in a new window). The castle is 80 miles from Shannon Airport, northwest of Galway. You go north on N84 from Galway through Ennis and Gort on to Headford. Then take R334 northwest to Cross. Then go west on the road to Cong and you will see the sign for the castle. Turn in through the entrance gate and wind in on the road to the castle.